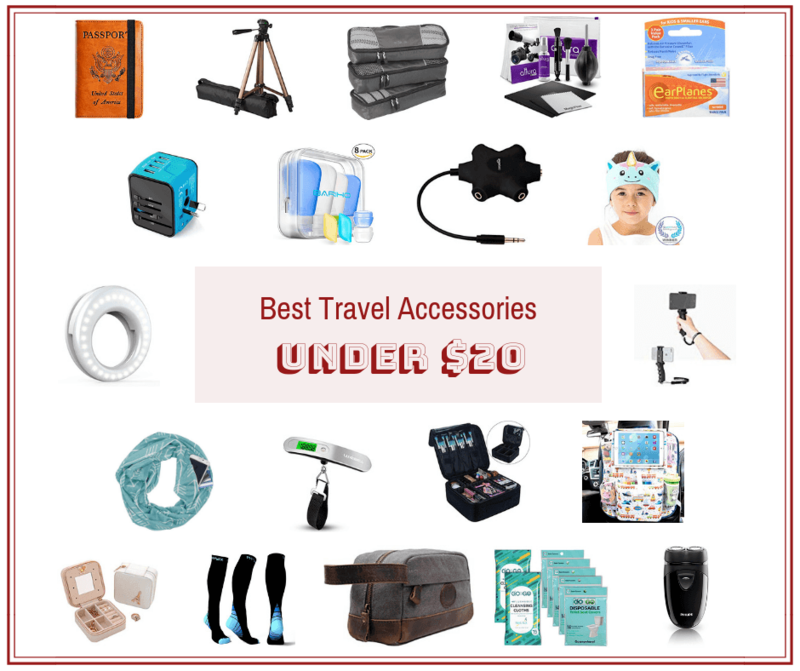 Check out the best travel accessories under $20! Perfect travel gifts for women, men, and kids. We have listed 20 fun travel gifts that won’t break the bank! As budget travelers, we appreciate finding cheap travel accessories. We get these for ourselves, and often for others that we know love to travel as much as we do. So whether you’re looking for the best travel gifts under $20, or for your own budget travel accessories, we’ve got some great ideas for you! Infinity Scarf – Perfect for accessorizing and/or keeping warm, this scarf also has a hidden pocket to keep small items close by. Cosmetic Bag – This cosmetic bag has plenty of storage and many of the compartments are adjustable. It also has spill-proof interiors. Travel Jewelry Box – Keep stylish and organized with this jewelry box that holds earrings, rings, necklace, and bracelets. Toiletry Bag – This canvas and genuine leather bag is perfect to keep all of your toiletries in. It has also a small inside zipper pouch and an outside zipper pocket. Passport Cover – This passport cover is not only stylish, but also has room for your passport, credit cards, airline tickets, and two SIM cards. It is also RFID blocking. Electric Razor – This compact electric razor is battery operated but still packs a punch. Up to 60 minutes cordless shave. Backseat Organizer – Perfect for those long road trips (or every day), this organizer fits tablets up to 11.5 inches, has plenty of pockets, and is made of sturdy and easy to clean materials. Kids Headphones – These cute and super soft fleece headphones are a great alternative to bulky and uncomfortable headphones. They are noise limiting to help protect little ears and the speakers can be removed to wash the headband. Ear Plugs – These are great for relieving air pressure discomfort. No more crying kids! Tested by U.S. Navy Pilots and approved by Flight Attendants. Toilet Seat Covers – Germs are everywhere, so keep the kiddos protected. This pack of 50 disposable toilet seat covers also comes with 50 flushable wet wipes. Tripod – This adjustable-height tripod is lightweight, has a 3-way head that allows it to tilt and swivel, and comes with it’s own bag. Professional Cleaning Kit – Take care of that expensive camera with this kit that includes photo lens cleaner, lens cleaning pen, lens brush, air blower cleaner, tissue paper, and microfiber cleaning cloths. Selfie Light Ring – Always have perfect lighting for your selfies! It’s also great for shooting videos on your phone or laptop. Cellphone Stabilizer – This handy cellphone holder (see what I did there?) has an ergonomic design and will make taking photos and shooting videos so much easier. Digital Luggage Scale – No one likes paying overweight baggage fees. Make sure your luggage is good to go before even reaching the airport. Universal Adapter – Stop buying adapters for each country you visit and buy one that you can travel with all over the world. This particular adapter is fast charging and you can charge five devices at a time! Travel Bottles – Save money by filling these up with products you already have at home. Includes four bottles, two cosmetic containers, two toothbrush covers, and TSA approved cover bag. Packing Cubes – These have completely changed the way we pack! Everything stays organized and we’re actually able to squeeze in a lot more clothes. Headphone Splitter – Perfect for airplane travel and road trips, this splitter can deliver sound to 5 headphones at a time! Compression Socks – These lightweight, breathable, and durable compression socks will boost your blood circulation while on long flights. For more useful travel accessories, check out our Carry-On Essentials. We hope this list has helped you find some great travel accessories, whether they’re for you or your favorite traveler. And remember, just because they’re cheap travel gifts, doesn’t mean they’re not useful travel gifts! I dig that selfie light ring Vicky. Awesome investment for under 20 smackers.